Shop to make a difference. Our country is in a national epidemic of obesity. Everyone agrees that kids need exercise, yet many physical education programs are under-funded. Smart educators are shopping for activities to take into their classrooms that get kids to move while they learn! Math Is My Bag is packed with activities that get kids to move, but it goes beyond the important value of exercise. It is widely recognized that some kids need to move to able to understand basic ideas of education. 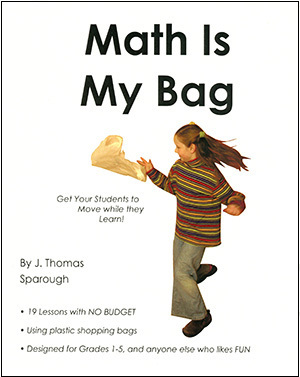 These kinesthetic learners will benefit tremendously from the math lessons of this book. Every student needs to be able to work on his or her own, be able to work with a partner and a small group, be able to problem solve, and be able to express ideas. Math Is My Bag inspires students to work at all of these areas of learning. The best part is that all of these activities are fun. Kids love the challenges and learning experiences. Teachers don't need a budget to do these activities. All the smart shoppers need to do is save their shopping bags.